Now here's the goal of the game. 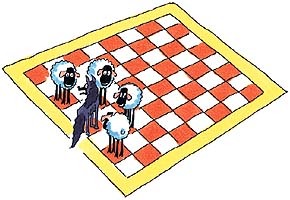 It's not like checkers, where you jump over the bad guy and take away that piece. Wolfy wins if he can find an opening through the line of sheep. If you can't find any doohickies or whatevers to play with, cut out these illustrations and paste them on pieces of cardboard. 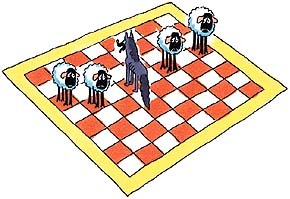 The sheep win if they can prevent Wolfy from breaking through, pinning him so he can no longer move forward or backward. Ta Daaaa! That's it. Simple as that. Try it and let me know who wins. By the way, there is a way in which one of the sides can never lose, but I ain't gonna tell you. So there!